It truly feels good to have the No More Heroes series back home on a Nintendo platform, Travis Touchdown’s last outing pushing close to nearly a decade old now (has it really been that long?). Looking back both the original and its sequel rank as some of Suda 51’s weirdest and also best work to date so you can imagine my level of excitement on hearing he would be returning to the franchise for a brand new Switch release. No More Heroes: Travis Strikes Again may be more of a spinoff than a full-fledged sequel but can it capture the same self-aware violent mayhem of the originals? You once again follow the story of Johnny Knoxville lookalike Travis Touchdown whose days competing in the United Assassins Association are well behind him. Living in a trailer out in the woods, his quiet, isolated life is suddenly disturbed by Bad Man, a vengeful father out to take Travis down for killing his daughter Bad Girl (a character you run into in the first No More Heroes). Amidst all the chaos though, both end up being sucked into the Death Drive MK-II, a mysterious gaming device that supposedly grants a wish to anyone who manages to complete its six games. To say the story in Travis Strikes Again: No More Heroes is a bizarre one would be underselling it, things only getting more unpredictable the further you progress. Sometimes to the point that I lost track of what was even going on. So fans of Suda 51’s previous work should definitely be pleased to hear that. 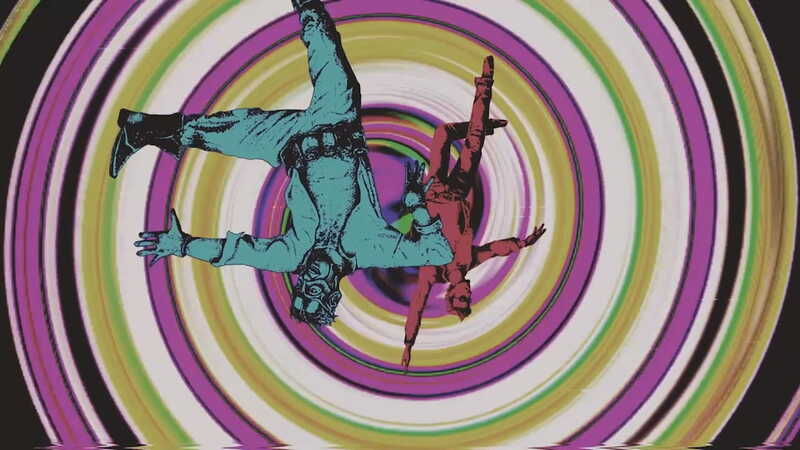 The format of Travis Strikes Again: No More Heroes is essentially broken out into six different games taking place within the Death Drive itself. Each one promises a unique experience – an ambitious promise for any game – and one that it isn’t always successful in achieving despite its insistence to try and inject elements from varying genres. You see at its core, Travis Strikes Again comes down to being a simple hack and slash actioner from a somewhat raised perceptive. This is the foundation of each Death Drive experience and what you’ll spend a majority of the overall game actually doing. Rather than each game taking on completely new forms, they’re instead sprinkled with odd moments where you’ll perform other actions. Life is Destroy for example features a tile-based puzzle element, the aim to construct a path through a neighbourhood to a particular residence, which you’ll then need to fight your way through. Coffee and Doughnuts meanwhile handles more like a side-scroller complete with platforming sections – albeit with poor handling – between more battles. While these changes in gameplay offer some much-needed variety to the mix, they’re limited not just in frequency but also how developed they feel. The puzzle element of Life is Destroy is a challenging and fun idea but one that plays a supporting role to a lot more hack and slash combat. The platforming in the aforementioned Coffee and Doughnuts feels sloppy to actually play. Gold Dragon GP sees you competing against opponents in surprisingly fun drag races, your responsibility to move the gear stick at the right moments. Between races though, you’ll then need to search floors for better bike parts, which means – you guessed it – more fighting. The deeper into the game you get the more this feeling of repetition starts to set in feels, the ratio of combat situations to newer ideas shifting even further toward the former. Killer Marathon feels like a total misfire (I won’t say anything to avoid spoilers) while Serious Moonlight – as neat as the twist is – dilutes down to simply bigger groups of enemies to take down. It’s not that the fighting portion is bad per se, rather there’s just so much of it. It’s a real disappointment especially with information and trailers of the game pointing toward six unique experiences. On the topic of combat, Travis once again wields his trusty Beam Katana to slice and dice his foes while Bad Man swings a baseball bat. Their move sets include weak and strong strikes, a roll, a jump and a special chargeable attack. It’s a relatively simple system and one that can grow a little repetitive, especially in extended play sessions. Collectable chips help spice things up though, offering Travis and Bad Man bonus attacks or perks on a cool down. These can range from summoning a spot to heal, throwing a sticky bomb or even placing a turret. With four slots to equip its often fun to experiment and find a combo that works best for your play style. When you’re not in the Death Drive MK-II Travis and Bad Man are free to wander around the campsite. It’s here where the much-touted use of other independent games makes an appearance albeit just in the form of t-shirt designs. While it’s neat to see so much representation – everything from Dead Cells and Celeste to Superhot and Pocket Rumble are here – it’s a shame they aren’t put to more important use especially given you rarely see the designs amidst battle. While the game can be played alone players also have the option to team up with a friend in co-op, the extra participant controlling Bad Man. With the top-down perspective, the game actually feels pretty well suited for two players and thanks to the fairly simple control scheme the Switch’s individual Joy-Con work pretty well too. When it comes to style Travis Strikes Again: No More Heroes deals it in spades whether it’s the punk-rock flair of Travis himself or the various visual designs between game types that see you racing in a Tron-esque world one moment and reading through an old-school visual novel the next. Every aspect of the game has a real coolness to it and the same can be said for the music which features some great sounding arcade tracks as well as a fantastic guitar remix of the No More Heroes theme. Unfortunately, there’s little to no voice acting outside the game’s introductory cut scene and end credits, which is a real shame especially given the script’s often sharp and humorous writing. In typical Suda51 fashion expect plenty of fourth wall breaking and self-referential comments. The little audio we do have from the game’s lead and Bad Man are really strong and I was begging to hear more throughout my playthrough. Travis Strikes Again: No More Heroes is a solid return for the assassin but one not without its problems. While the writing feels just as sharp as ever, unfortunately, its six-game premise doesn’t feel like it totally lives up to its potential. Still it’s great to see a new entry in the long-dormant series and hopefully, this marks the beginning of a brand new chapter for Travis Touchdown and the league of assassins.